John G. Doyen was admitted to the Missouri Bar in 1964. He was graduated from Missouri State University (A.B. 1961); Washington University Law School (J.D. 1964). He is a member of the Missouri Bar; St. Louis County Bar; Metropolitan St. Louis Bar; Missouri Organization of Defense Lawyers; and Former Chairman of 21st Judicial Circuit Ethics and Disciplinary Committee. 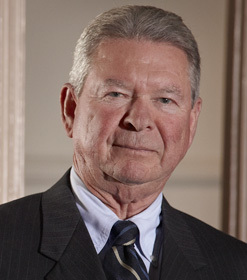 John Doyen and Bernard Brinker have been together in the practice of law for 48 years. John has practiced almost exclusively as an Insurance Defense Trial Lawyer along with the related Appellate Practice. He has taken voluminous trials to a verdict in a variety of Insurance Defense cases involving Medical Malpractice, Products Liability, Premises Liability, Insurance Coverage, and Fraud and Arson. John has been awarded a rating of AV Preeminent and has had the Highest Possible Peer Review Rating in Legal Ability and Ethical Standards for over 40 years. And Brinker & Doyen, L.L.P., has been accepted to the Bar Register of Preeminent Lawyers with the Highest Rating in Legal Ability and Ethical Standards. John ran his first marathon at 41 and has inspired many other B&D attorneys to do the same. He likes to play it. He likes to read about it. And of course, he likes to win at it. This keepsake commemorates the year John made partner at the firm now known as Brinker & Doyen.